Some curly girls face problems that require more assistance than others. Whether it is a weekly issue or just a problem from wearing extensions too long, a tangle can outgrow a tangle and turn into something else. Jasmina inquired in our Curly Q&A . Can anyone tell what causes of matted hair? This is my main problem and I still can't solve it. Does it have to be cut out? No, matted hair can be successfully detangled without cutting the hair. It takes patience, work, and product, but it can be accomplished and end up saving your strands and your nerves from being shot. 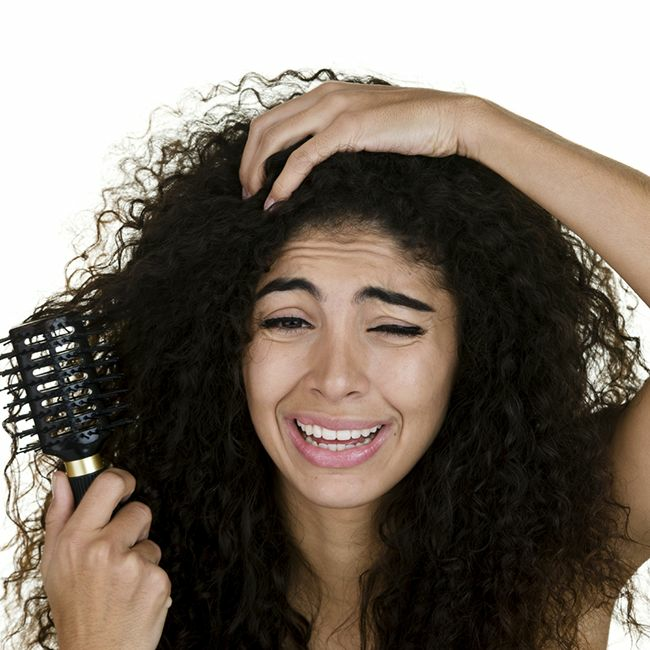 Yanking or ripping the hair apart leads to further damage to your strands. No one likes dealing with matted hair. While some may decide to seek a professional (hair stylist) to fix their matted hair, it can be done at home with a few tools and some serious patience. Loosen the matted strands by saturating with an excellent detangler, oil, or moisturizing conditioner but never a shampoo and water only. This is not the time to skimp so really saturate it. Some will allow the hair to sit for up to 30 minutes with the detangler and some even add heat to really get the product to loosen and soften the strands. Use fingers or a wide tooth comb to gently pull apart the strands, but take your time. The goal is to detangle your a hair and decrease further damage. Make sure to hold onto the hair near the root to prevent yanking and pain. There will be significant shedding so do not panic and remember we lose on average 100 hairs a day, and since the hair is matted those shed hairs are locked in and need removal. Have you experienced matted hair? How did you fix it?